Had a very “large” day with my husband yesterday. “Large” in Nova Scotia means a wonderful day full of fun activities. We left the house yesterday at 11am and didn’t get back until 10pm and 350 km later. We’re in the middle of Queens County, NS. So what can you get up to down this end of the province? Quite a lot actually, and for us it included three activities we had never done before. 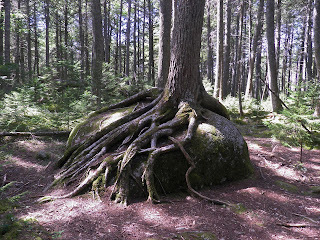 This hemlock isn't 300 years old, but it was cool. 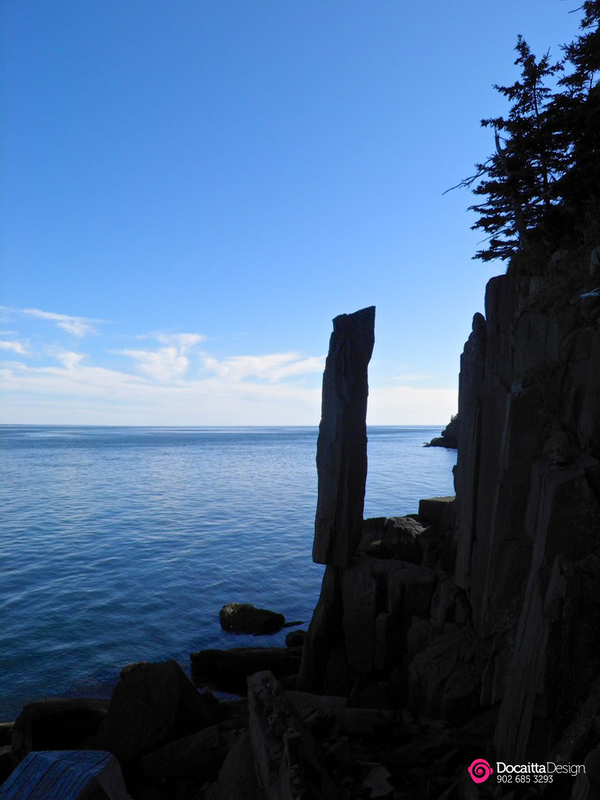 We first struck out to Kejimkujik National Park. We wanted to see some trees. Old growth hemlock, to be exact – some in excess of 300 years old. Adult day passes are $5.80 – do whatever you want all day until midnight. Our Bouvier Henry was free. The old growth hemlock walk is 5km in total, through some beautiful undisturbed forested area, all well marked and interpreted. We were in the middle of nowhere, so good signage is a comfort. The boardwalk through the old hemlocks was stunning. The 5 km was a snap – and we don’t really walk all that much. It was even fun to take the ferry to Long Island, although it was only a 5 minute quarter mile trip. The ferry ride was $5.50 round trip. It runs every hour, 24 hours a day. If you do want to see it, be aware there’s about 235 steps down to the water. Take your time. Henry was able to manage them. It’s worth it. Backtracking, we walked the Digby waterfront. It was charming and way more than I expected. The people are friendly – even the tourists! My husband Mike got some nice shots of the famous Digby fishing fleet. A stunning, blue sky day. Dinner was even a revelation. I had a club house sandwich at Irving’s Big Stop in Digby, but instead of turkey it had lobster! Lots of lobster. I’m making that at home. Best lobster "sandwich" I ever had. For such a full day you would think that we would have started earlier. That’s my fault. Before we left I had to make bread for the week. 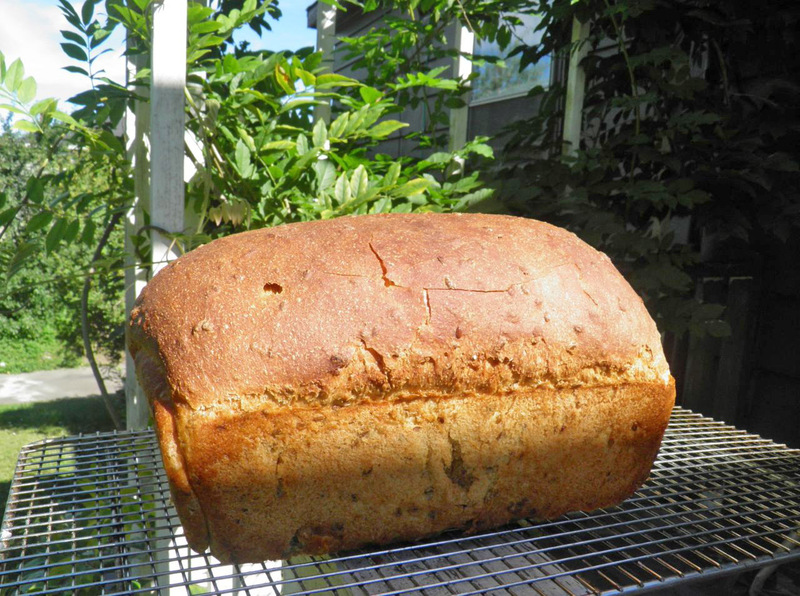 There’s nothing like starting your day’s adventures with warm, fresh bread in your belly. I’m so lucky. Good food, fantastic adventures, a wonderful dog (who probably regrets all the walking...) and a husband that is my heart’s twin. Can life get better? Proof the yeast in the warm water for 10 minutes until bubbly. Before and after rising – doubled in bulk. Mix in the red fife, 4 cups of the unbleached flour, molasses, flax seeds and salt. Bring together and try to knead on the counter. Only add enough of the remaining flour to make a dough that is still just slightly sticky. Punch the dough down, roll into a log by folding it over and place in a well oiled 9” x 5” bread pan to rise again. Second rise should only take between 1/2 and 3/4 hour. Preheat the oven to 400°F with a pan of water on the bottom rack to hydrate the oven. Bake the oven for 10 minutes, remove the water and then bake for an additional 25 minutes. 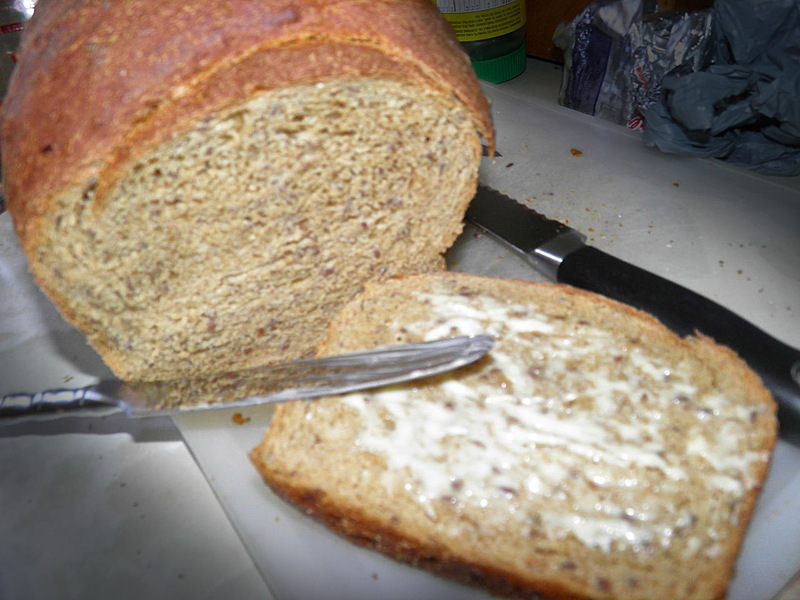 The loaf is done when it is nicely browned and the loaf sounds hollow when tapped with your fingers on top. Let cool slightly, remove from the pan and then let cool until you can’t wait to try it!